FORMER MID PENN MOTION PLAYER Jose Delerme, Jr. of Susquehanna Township played with MPM for 4 years before he decided to dedicate his time to gymnastics. He always knew that his dedication to the sport of gymnastics would change his life. He just didn’t know it would change so drastically. Jose, a 20 year old college freshman and gymnast with 16 years of experience, is now facing the competition of his life. As the 2015 Junior Olympics National Champion in the Still Rings, Jose is no stranger to performing under pressure and training his body to do stunts most of us watch in awe. His love of the gymnastics, his self-imposed discipline and his desire to motivate young people let him to become an instructor at the Artistic Sports Academy Plus. It was during a routine workout that Jose and his family’s lives changed in an instant. On April 1st 2016, Jose suffered a severe spinal cord injury while performing a fairly simple move on the pommel horse, something he had done successfully countless times before. In the days following the accident, nothing was certain. Jose was paralyzed from the top of his chest area and throughout his body. Even his breathing was affected. He underwent complex spinal surgery to fuse several vertebrae and spent 14 days at the Hershey Medical Center Neuro ICU. On April 14th, he was transferred, with a tracheostomy on the ventilator, to Magee Rehabilitation Hospital in Philadelphia, PA. His long and arduous journey to recovery was only beginning. Jose, an accomplished athlete who tumbled like a pro, who used his upper body strength to manipulate the rings and who counted on his legs to land him solidly, is now thankful for one foot forward, for putting a spoon to his mouth, for a simple conversation with loved ones. Through determination and prayer, Jose has made tremendous progress and there is hope for Jose. As he prepared for his discharge from Magee Rehab in Philadelphia, he was anxious to get back into his more familiar home environment, but he also realized how different it would be when he walked out the door to gymnastics practice on that fateful day. No one ever plans in the family budget to renovate a home for handicapped accessibility. No one ever plans on needing a special vehicle just to go from one pace to the other. On top of all that he is internally fighting for, these practical things are now necessary to make Jose’s life possible, inside and outside his home. Jose is blessed to have many friends and loving family, a testament to his character, who support him through prayer and visits. 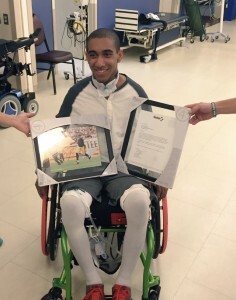 Jose was released from Magee Rehab in Philadelphia and participated in several weeks of in-home therapy. He continued his outpatient rehab at Penn State Hershey Medical Center. In preparing for Jose’s moving home, the family has been renovation their home to make the entrance and bathroom handicap accessible. They have purchased a handicap accessible van as well to transport him as needed to rehab and other events. There will be many more improvements, such as handicap bathroom and hardwood floors to allow a wheelchair, and many out of pocket costs expected. To help offset these costs, a Hope For Jose fund has been established and numerous fundraising activities have been held by family and friends to raise money for the family. Mid Penn Motion is also trying to help in this as well. Please consider making a donation to Mid Penn Motion earmarked for Hope For Jose fund. Every donation made is greatly appreciated.